With the National Judicial Appointment Commissions verdict in place, the system for appointment of elevation of Judges needs to be re-instituted, in order to take care of the vacancies in the High Courts of the country, which have crossed the mark of 400. Out of the 24 High Courts, 13 are working on less than 65% of their approved strength, considerably waning the working capacity of the Judiciary. Meghalaya, Sikkim and Tripura High Courts are the only ones functioning with zero vacancies. As on October 1, 2015, Allahabad High Court has the largest number of vacancies, standing at 85. It is hence currently working at less than 50% of its approved strength. 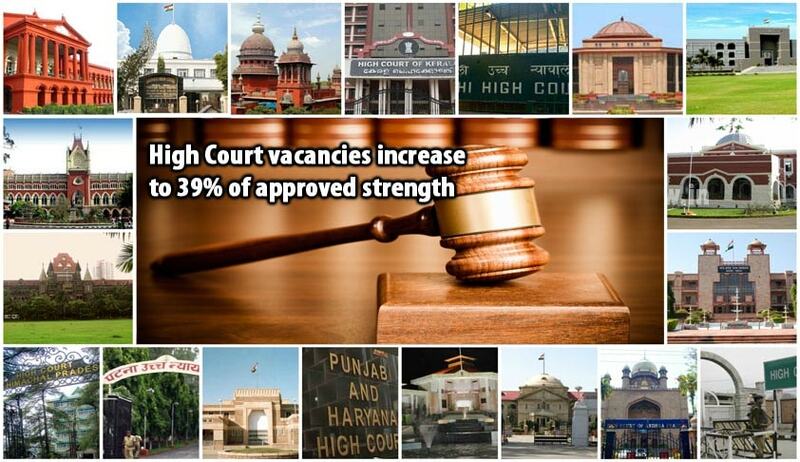 Karnataka and Rajasthan High Courts are working at 50% of their approved strength. Manipur High Court is functioning with 1 vacancy. Even though Punjab and Haryana High Court has the second largest approved strength, it is working with 61% of that strength. With the High Courts functioning at 61% of their approved strength, the dream for reducing the pendency of cases is unlikely to materialize in the near future. The condition is aggravated by the absence of any mechanism to appoint or elevate Judges to the High Judiciary. After the National Judicial Appointments Commission declared unconstitutional in a momentous decision rendered by the Constitutional bench of the Apex Court of India, Chief Justice of India H.L. Dattu has reportedly called a meeting of the Supreme Court collegium to recommend names for appointment and elevation to High Courts of the country. The collegium, comprising the Chief Justice himself, along with Justice T.S. Thakur and Justice A.R. Dave, will deliberate on the issue of extending the term of about 30 Additional Judges of various High Courts, who were earlier provided with a three month extension. With the decision finally rendered, the dismal straits for High Courts should now be focussed on, in order to reduce the ever mounting backlog of cases that has been plaguing the Indian judiciary for decades now.